Welcome to Dianna Agron Online, your fansite for the talented actress Dianna Agron. Our goal is to provide you with the latest news and photos of Dianna and her career. You may recognize her as Quinn Fabray from FOX's Glee, and movies such as I Am Number Four and The Family, but also from her role as Dahlia in the West End London Production of McQueen - The Play. I hope you will enjoy your stay, and that you will come back for all the latest and greatest news and photos of Dianna! The one-hour series follows an optimistic high school teacher as he tries to transform the school’s Glee Club and inspire a group of ragtag performers to make it to the biggest competition of them all: Nationals. McKinley High School’s Glee Club used to be at the top of the show choir world, but years later, a series of scandals have turned it into a haven for misfits and social outcasts. Will Schuester (Matthew Morrison, Broadway’s “Hairspray”) has offered to take on the Herculean task of restoring the Glee Club to its former glory. Even with the help of fellow teacher Emma Pillsburry (Jayma Mays, “Ugly Betty”), it won’t be easy since the “brightest stars” of the pitch-imperfect club include Kurt (Chris Colfer), a nerdy soprano with a flair for the dramatic; Mercedes (Amber Riley), a dynamic diva-in-training who refuses to sing back up; Arty (Kevin McHale, “True Blood”), a geeky guitarist who attracts more bullies than girls; and Tina (Jenna Ushkowitz, “Spring Awakening”), an awkward girl who needs to suppress her stutter before her center stage solo. Will’s only hope lies with two true talents: Rachel (Lea Michele, “Spring Awakening”), a perfectionist firecracker who is convinced show choir is her ticket to stardom; and Finn (Cory Monteith, “Kyle XY”), the popular high school quarterback with movie star looks and a Motown voice who must protect his cool reputation with his holier-than-thou girlfriend, Quinn (Dianna Agron), and his arrogant teammate, Puck (Mark Salling). Will is determined to do whatever it takes to make Glee great again, even though everyone around him thinks he’s nuts. He’s out to prove them all wrong-from his tough-as-nails wife Terri (Jessalyn Gilsig, “Nip/Tuck”) to McKinley’s cheerleading coach Sue Sylvester (Jane Lynch, “Best In Show,” “Role Models”) to an ber-hip world that thinks jazz hands and sequined tuxedos litter the road to infamy rather than pave the way to Hollywood dreams. Quinn Fabray is an ex-cheerleader, who was kicked off after becoming pregnant. She hates contraception, or anything that could be seen as going against the bible. Quinn is setting herself up to rule William McKinley High, but after one indiscretion she is pregnant with Noah Puckerman’s baby. Her nemesis, Rachel Berry, is a loser and she makes sure everyone knows it. Her parents kicked her out of the house after finding out she is pregnant and she stays at Finn’s house. However, Finn breaks up with her after he finds out from Rachel that he is not the real father of her baby. She lives with Puck from then on. She then moves in with Mercedes and has her baby after her mother starts talking to her. • All cast members do their own singing and dancing. • 70 songs were used in the first thirteen episodes. • The role of Quinn Fabray was not cast until the night before filming began. A woman with a troubled past sets out to find her missing brother. Set in the early 1960s and during the era of Vatican II, a young woman in training to become a nun struggles with issues of faith, the changing church and sexuality. After new CIA recruit is seriously injured during a mission his wife Tess, a former CIA operative, becomes determined to find out what happened to her husband. A beautiful and haunting voyage into the visionary imagination and dark dream world of the late Alexander McQueen, fashion’s greatest contemporary artist. A young girl in Nevada becomes romantically involved with a female drifter who introduces her to a life of stripping, drugs, and metaphysical experiences that teach her what happens when real life catches up with dark fantasy. A young woman struggles to move on with her life after the death of her husband, an acclaimed folk singer, when a brash New York writer forces her to confront her loss and the ambiguous circumstances of his death. A family man who has it all until he risks losing everything due to his inability to fight off his obsessive temptation for other women. For optimal viewing: This website is best viewed in a resolution of 1024x768 or higher and in the web browser Mozilla Firefox. 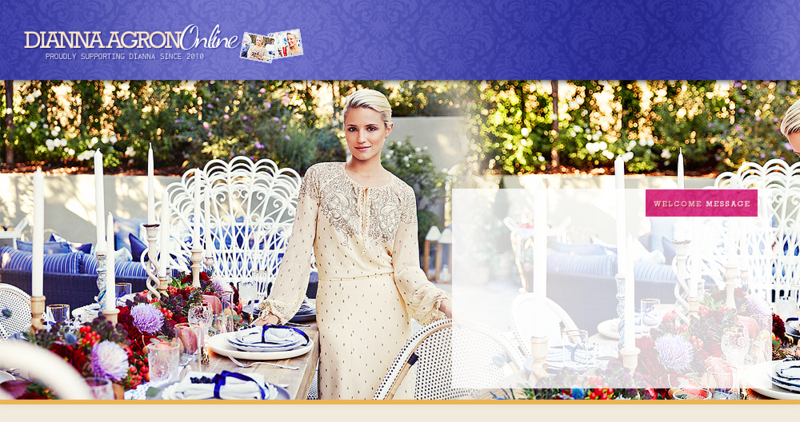 All graphics and written content belong to Dianna Agron Online, unless otherwise stated. This is a non-profit fan site. We are not endorsed by Dianna Agron or anyone connected to her. All photos are copyright to their respective owners, no copyright infringement is ever intended.